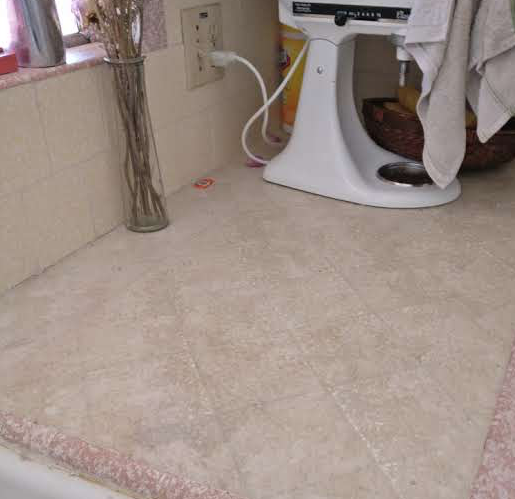 Here where I live, every house seems to have tile counter tops. It’s horrible. 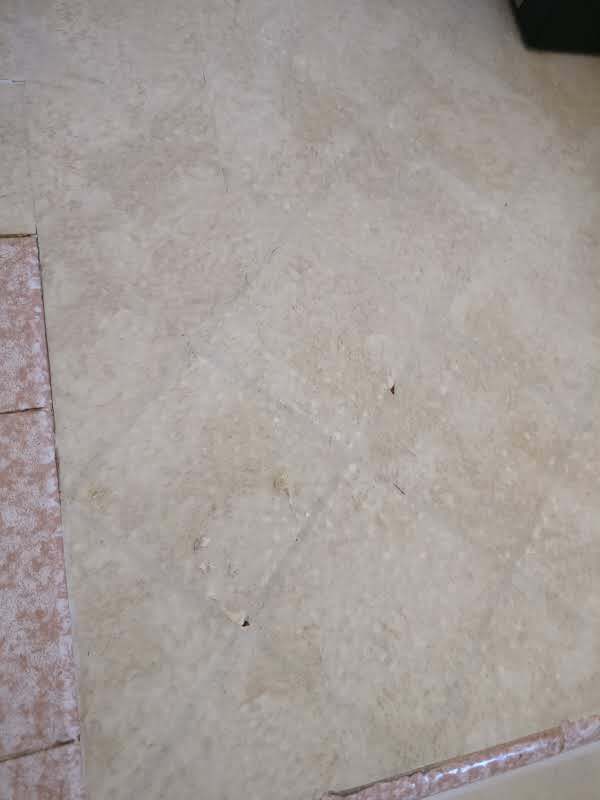 I make a lot of bread, and tile counters are a baker’s nightmare. 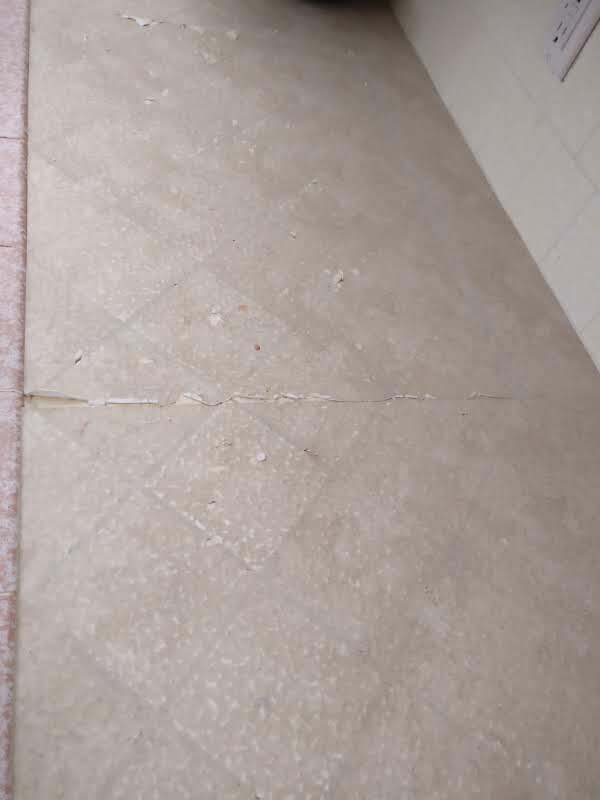 Flour is annoying enough to clean off of a flat counter, let alone out of every inch of grout it touches. 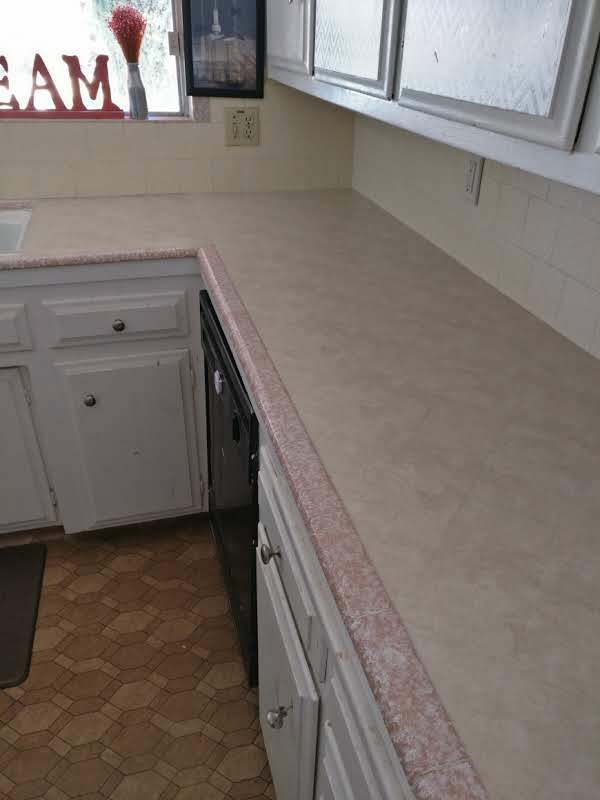 Every once in awhile, I see houses in town for sale that have remodeled kitchens… with NEW tile counter tops! What? Who is making this decision?! Obviously not someone who ever cleaned them. 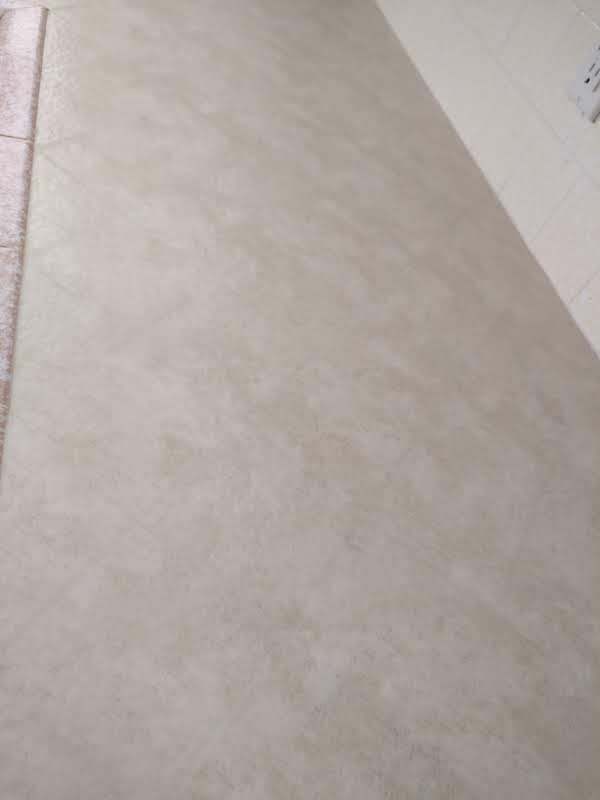 Anyway, the house we bought has these….lovely….pale yellow tile countertops with dark grout. It’s uglier than ugly, and beyond gross to clean. We (most certainly) plan on remodeling our kitchen, but we need más dinero. 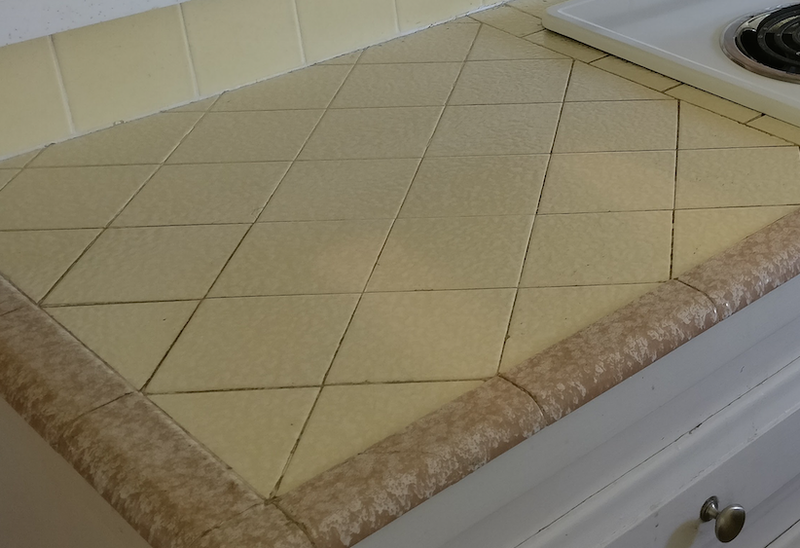 We endured the counters for about 3 months, but we needed a quick fix to our dreadful tile countertops. 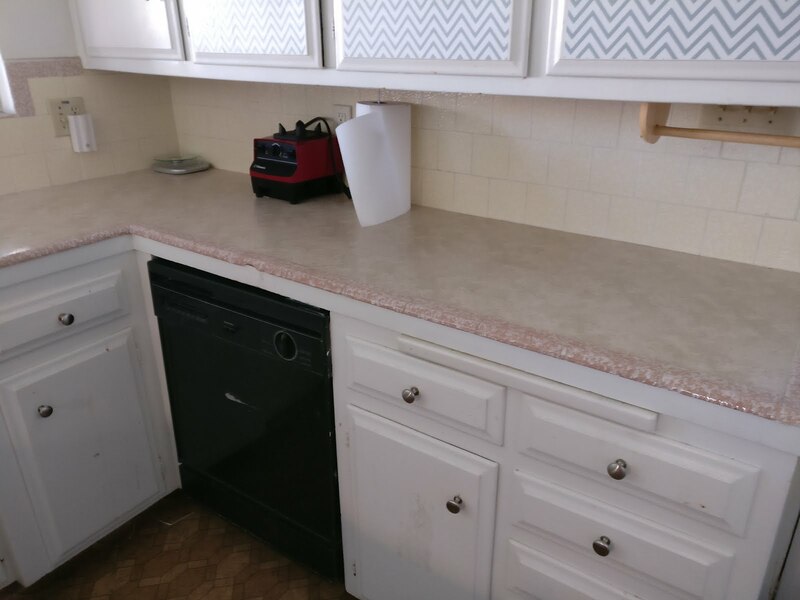 If you hate your tile countertops, and you can’t do anything about it (due to insufficient funds, or if you’re living in a rental), then contact paper is your new best friend. Step 1: Buy contact paper. When I went to redo the whole counter this week, Dollar Tree didn’t have the style I liked, so I went to WalMart and I ended up finding the same style, in a bigger roll. Which made me happy. Cause I already knew I liked it. I got 20 feet of contact paper for $5.60 from good ol’ WallyWorld, and we had more than enough to cover all our counters. You don’t have to get my creamy granite-y boring contact paper. There are lots of different patterns and brands of contact paper to match your style, budget, and kitchen. Step 2: Clean your counters. Scrub and dry your counters, especially around the edges. 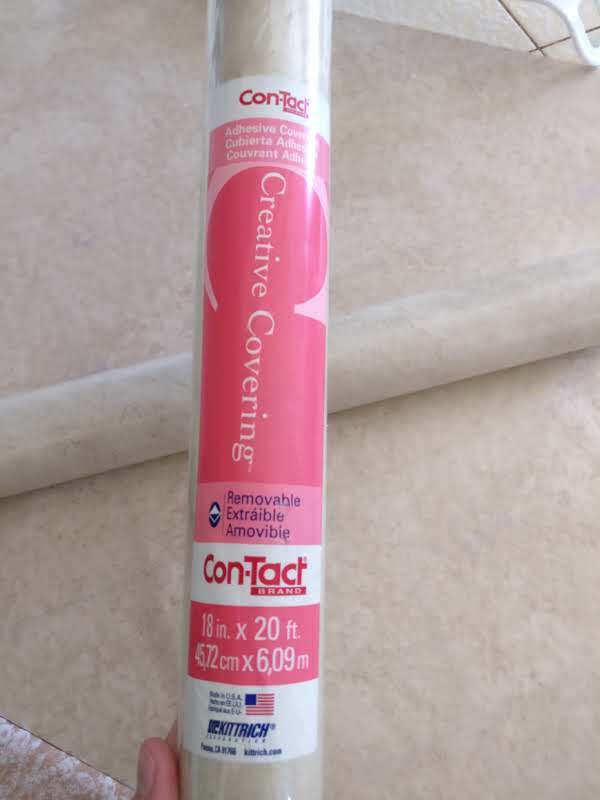 It doesn’t have to be perfect or anything, but clean, dry counters will help the contact paper stick so much better, and therefore last much longer. Step 3: Measure and cut. Measure twice, cut once. Figure out the most efficient way to apply your contact paper. You honestly don’t have to be perfect about it at all, but you don’t want to waste contact paper because you were careless. We applied our counter in about 12 different sections and strips (about 4 main sections). Make sure you overlap layers a little bit (1/2 or 1 inch), or you will probably get gross food build-up underneath the contact paper. Cover every surface, no matter how small. It will make the counter look more seamless. Step 4: Stick it down. I did this by myself the first time, but it was so much easier the second time with my husband’s help. It’s a lot easier with a second pair of hands. I stuck the edges and smoothed the contact paper down while my husband held it straight and adjusted the paper when it was askew. I was also able to stick it down in much larger strips with his help. Step 5: Take care of it, at least a little. You can cut food onto the counter, but don’t go crazy unless you’re feelin’ like dishing out another couple bucks for more contact paper. Step 6: Remember, it’s just contact paper. This isn’t marble or granite here. Chances are, it’s going to cost you under $10 (and an hour or two of time) to cover all the counters in your kitchen. That’s a pretty cheap “kitchen remodel.” It will be durable for several months, but this isn’t a long-term solution. It’s just a really handy quick fix to help you like your kitchen a little more! As you can see, it’s….fine….it’s just worn out, and shabby looking. This is another section that we replaced after about 3 months. It’s the part of our counter where we use heavy appliances the most, so it gets ripped from dragging around the crock pot, blender, mixer, and pressure cooker. I also didn’t do a great job of overlapping the layers last time, as you can see. We’re super excited and happy! We love having a short-term solution to our tile countertop problem. 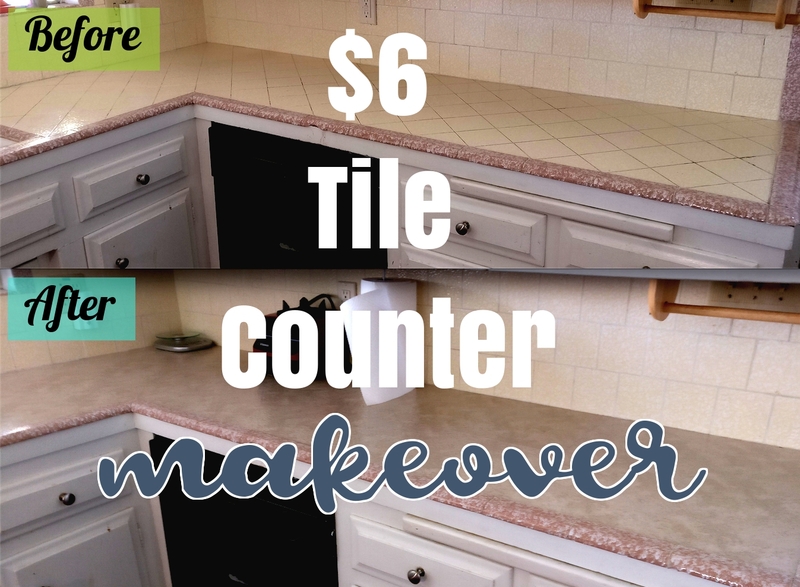 Recover your counters, too, and send me a picture of your contact paper countertops!